Humanity has been brought back to the Dark Ages, but remnants of a once highly advanced civilization still exist. In a world where control over ancient technologies means power, a ruthless Empire has arisen. You play as a team of Ruinhunters searching for the one thing that can save their village – a legendary weapon known as Aegis. Explore, build, & defend in this 2D platformer that blends Metroidvania style combat with Tower Defense strategy. 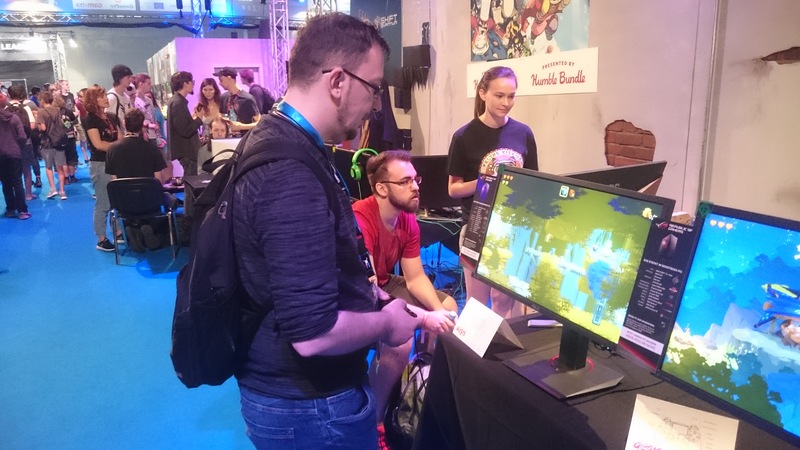 During Gamescom 2017, Aegis Defenders was being showcased at the Indie Arena Booth and we had the chance to pass by and talk to Max Palazzo, producer of the game. Max explained the game to us as a genre mash-up, basically mixing metroidvania and tower defense elements in different phases on the game. First you go out exploring and collecting items and resources and then you set up defenses with what you have collected, in order to protect yourself against incoming enemies. The game of course has a lot of exploration elements tied into its metroidvania style too. The studio started out four years ago and is basically the collaboration result of four students that met at a university in the US. They are based in Southern California and have been developing the game ever since they started working together. Halfway through the development, the game apparently even went through a complete revamp and from there onwards, a lot has changed for it. “We feel like we are doing something that has been done before, but definitely not exactly this way, so we learn a lot as we go,” explained Max, continuing to tell us about how there was a lot of experimentation and testing going on for the game at all phases of development. Having to control multiple characters, (influenced from things like The Lost Vikings for example as Max explained) was something that the studio had to develop as good as they could. “We had to go with a lot of different design decisions out of necessity,” he told us. The studio is now done with the current content and there is only a bunch of debugging and polishing to be done. W were told to expect a release in winter of 2017 on PC, Mac and PlayStation 4. The team is working full-force on the game and they are also preparing to head to PAX West right after Gamescom, where they will be part of the Indie Mega Booth. You can check Aegis Defenders out through its Facebook, Twitter, Steam page and website.